One of the hallmarks of this blog, at least as I envisioned, is to be unfailingly critical even when that's uncomfortable. I'm willing to point to problems and disability representation in works of journalism, literature, and art, even from people whose work I admire. I try to be equally critical of my own conduct, and listen when I make mistakes – as I invariably do. That is the only way for our movement to get stronger. I am writing this post because Jennifer Laszlo Mizrahi, founder and CEO of RespectAbility, a disability rights and advocacy organization - and someone who was first a source and then an employer of mine - posted a racially biased statement on her private Facebook today. The post was set to public and I was alerted to it by a number of people. If Hillary wins it will because of white voters who care about people with disabilities. BTW, this is NOT a partisan thing. The same is true of Republican Sen. Richard Burr in NC who is running as the pro-PwDs candidate there.. THE POWER OF VOTERS WITH DISABILITIES WILL DETERMINE THE OUTCOME OF THE 2016 ELECTION! Remember that George H.W. Bush signed the ADA! 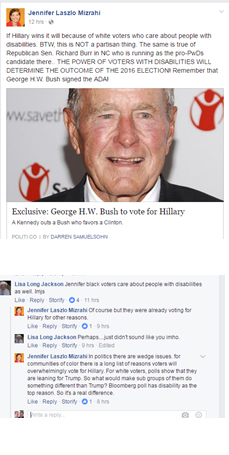 Jennifer Laszlo Mizrahi Of course but they were already voting for Hillary for other reasons. Jennifer Laszlo Mizrahi In politics there are wedge issues. for communities of color there is a long list of reasons voters will overwhelmingly vote for Hillary. For white voters, polls show that they are leaning for Trump. So what would make sub groups of them do something different than Trump? Bloomberg poll has disability as the top reason. So it's a real difference. The post is now down. Lauren Appelbaum, communications director of RespectAbility, posted that the comments of any individual do not represent the organization, but that she is more than willing to discuss the views of RespectAbility. Last May, I worked for RespectAbility in helping to edit a memo that Mizrahi wrote to the White House into a publishable form. I worked for a few days making the early draft, then took a more passive role from the project and changed my byline to "edited by," as the document evolved. Before that, I interviewed Mizrahi as a source last Fall, wrote about the RespectAbility Fellows in January, and was sent by RespectAbility to write and learn about disability at the New Hampshire primary. I believe that their work during the Iowa and New Hampshire primaries was outstanding, including their candidate questionnaires which pushed people to go on the record on disability issues. I stand by my assessment that the organization is filled with people working tirelessly for disability rights and am proud of the reporting I've done on them. But I reject this post by Mizrahi. It is racist. It is wrong. And it doesn't matter whether the racism was intentional or unintentional. It is ethically wrong. It is also factually wrong. The Obama Coalition (which proved just fine at electing presidents) depends on motivating large numbers of non-white voters to go to the polls. Yes, there are conservative well-off white voters who do not care about Trump's racism, hatred of Islam, terrible economic plans, lack of experience, history of predatory business practices, sexism, or other flaws...but do care about disability. They may be people who will shift to Clinton. Every vote counts. But surely if Clinton wins, it will be because both Trump's hatemongering and Clinton's experience and policies motivate the whole Obama coalition - which is led by nonwhite voters - to turn out and even expand. A landslide would be a sign that moderate conservatives reject Trump. A victory will be people of color saving America from a would-be tyrant. To erase them is both wrong and biased. I am sure that in the coming days, plenty of disabled people of color will be writing about this. As that happens, I will be sharing their work. I do not wish to speak for anyone but me, and be as clear as possible in my rejection of this kind of statement. I have also reached out to RespectAbility, formally, for comment. RespectAbility has become important. It's connected to many of the movers and shakers in D.C., the corporate world, and the big non-profits. That's even moreso true now that it was named in a letter from the CEO of the Ford Foundation as a reason that they are going to be increasingly focused on disability justice. I have always had great interactions with Mizrahi and her team, which is why it's so important to me to write this post. I've tried to address some related concerns over email, but now it's time to respond to the public Facebook post with this comment of my own. Our disability rights movement must address intersectional issues of justice - including race, class, gender, sexual orientation, religion, and more - or it will fail. That intersectional frame needs to be built into the foundations of our organizations, our fundraising, our advocacy, our writing, and everything else we do. RespectAbility is going to have to prove itself, now. I wish them the best of luck. Start with listening to the people she has just erased.